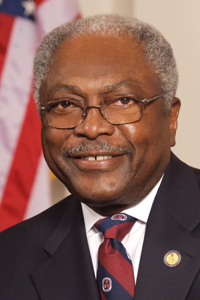 Congressman James E. Clyburn of South Carolina will speak to a joint session of the New Mexico Legislature on Friday as part of African American Day at the Roundhouse. Clyburn, House Majority Whip, is the third-ranking Democrat in the U.S. House of Representatives behind Speaker Nancy Pelosi and Majority Leader Steny Hoyer. Clyburn started his career as a public school teacher and is a veteran of the civil rights movement, helping to organize marches and demonstrations as a student leader at South Carolina State College, according to his congressional website. He met his wife, Emily, in jail following a student demonstration. Clyburn, whose speech will cap Friday’s celebration of African Americans in New Mexico, will speak to members of the state House and Senate around noon. The House made quick work last week passing a measure that would lift a veil of secrecy on how individual lawmakers allocate capital infrastructure money under their control. Currently, New Mexico is the only state in the nation that allows legislators to divvy up among themselves a big chunk of infrastructure money to direct to projects as they see fit.